A large amount of investigations informs about primary steps of mammalian kidney development such as anlage of the organ and initial nephron formation, while only few data exists about the late phase of human kidney development. In particular, little attention was up to date addressed to the decrease of morphogenic activity in the nephrogenic zone short before birth and the vanishing of all stem cell niches aligned beyond the organ capsule. There is evidence that molecular controlling of this normal but degenerative developmental process also plays a decisive role in the kidneys of preterm and growth restricted babies. Although they are born in a phase of active nephrogenesis, a substantial percentage of them evolves oligonephropathy, formation of atypical glomeruli and immaturity of parenchyma. Pathologic findings point out that independent from chemical nature all suspected hampering influences sublimate in the nephrogenic zone. However, it is unknown, whether impaired nephrogenesis is locally caused by harming interstitial fluid, disturbance of morphogen signaling, unbalanced synthesis of extracellular matrix or limited cell to cell communication. Thus, first of all these issues must be resolved, then save application of medicines prolonging nephrogenesis waits for realization. Due to the unexpectedly complex microanatomy and physiology of the nephrogenic zone, it will be a particular challenge for the future. A lot of information is available dealing with development of the mammalian kidney. The major part of published literature was generated during the last years by an expanding repository of transgenic animals, progressing molecular and imaging techniques  . In most instances interest of research focused to the organ anlage and the primary formation of nephrons in mice kidney. In contrast, comparatively few data exists for the human developing kidney. This applies in particular for the late fetal period short before birth, when an unknown mechanisms switches off morphogenic activity in the nephrogenic zone. The change in developmental program is correlated with a loss of all stem cell niches aligned beyond the organ capsule so that formation of nephrons is terminated for the future live . By the first view, the changes in developmental potential seem to be only of general biomedical interest. However, as well for preterm as low birth weight babies this subject is of special importance  . Although born in a phase of active nephrogenesis, a high percentage of them evolves oligonephropathy and prematurity of renal parenchyma causing severe restrictions for health later in life  . Various intra- and extrauterine influences seem to be responsible, but independent from chemical nature all noxious parameters converge finally to the nephrogenic zone and the here contained stem cell niches  . An important research assignment is therefore to identify locally acting molecules impairing nephrogenesis, to find a strategy to antagonize their effects and to learn about drugs, which enable to prolong nephrogenesis by methods of modern regenerative medicine  . However, development of a concept for recovery of the nephrogenic zone and contained stem cell niches is more difficult than commonly believed. First, so far no systematic analysis was performed to work out ultrastructural aspects of the nephrogenic zone in a human fetal kidney. Second, due to an incomplete vascular supply an effective access for an administered drug via the capillary system is unknown. Third, molecular aspects concerning morphogen transport and molecular signaling have to be adapted from animal species without knowing, whether beside homologous mechanisms also human-specific differences exist. Without interpreting ethical issues, treatment of impaired nephrogenesis in a preterm infant principally could be implemented either by selected morphogens and related molecules using an innovative drug delivery system  or by an implantation of stem/progenitor cells into the subcapsular space of the kidney . Consequently, detailed knowledge is required about the distribution of an administered drug in the nephrogenic zone, binding on locally existing extracellular matrix, bioavailability on the site of niches, reaction on the target, metabolism and possible embryo-toxic side effects on neighboring maturing parenchyma. The same applies to correct implantation, survival, seeding and integration of stem cells in existing operational structures. Besides all this, one has to ask the question, whether the correct generative support of implanted stem cells is provided on demand. The actual problem is that the necessary information does not exist for a human fetal kidney. For this reasons, earlier findings from animal experments must help for the moment to explain some details. It is obvious that only an intense research program over years can answer raised human-specific issues. To facilitate the entry in that complex matter, elected features of the nephrogenic zone in context with drug delivery shall be presented here. The nephrogenic zone of a fetal mammalian kidney straddles as a band beyond the organ capsule and shows a width of up to 100 µm depending on species . In histological sections stained by hematoxylin-eosin solution it exhibits a slightly pronounced color profile . For this reason, the nephrogenic zone is termed in single cases ‘blue strip’. From top to base, the nephrogenic zone is not a random accumulation of stem cells but it is specifically structured. The covering organ capsule consists of a tunica fibrosa and muscularis ([Fig. 1]). Contained smooth muscle cells form here a unique tunnel system filled with fluid . When exactly orientated sections are analyzed, beyond the inner side of the capsule only 2 layers of mesenchymal stem cells are visible. The inner layer of them is separated by an interface from tips of ureteric bud-derived CD ampullae containing epithelial stem cells ([Fig. 2]). Further on, each tip of the aligned CD ampullae points towards the capsule. At the lateral aspect of a CD ampulla condensed mesenchyme, renal vesicles or S-shaped bodies are visible reflecting morphological signs of active nephrogenesis. Slightly further down, the dilated part of a CD ampulla continuous to a neck and then to a shaft that is connected with a with a differentiating CD tubule . This area defines the inner limit of the nephrogenic zone. Fig. 1 Semithin section of the nephrogenic zone (NZ) localized in the cortex cortices of a neonatal rabbit kidney. The histological section lines perpendicular to the organ capsule (C) and in parallel to lining collecting duct (CD) tubules. Each of them exhibits a neck (X) and forms at the ending a CD ampulla (A). At the lateral aspect of a CD ampulla renal vesicles and S-shaped bodies (S) indicate active nephrogenesis. Fig. 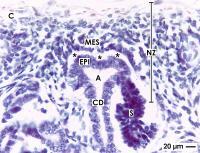 2 Details of the nephrogenic zone (NZ) and a stem cell niche in fetal human kidney shown by optical microscopy. A niche is covered by the capsule (C). Epithelial (EPI) stem cells are enclosed in the tip of an ampulla (A) at the end of a collecting duct (CD) tubule. Mesenchymal (MES) and epithelial stem cell bodies are separated by a striking interface (asterisks). S: developing S-shaped body. Surprisingly, not only in the nephrogenic zone but also in the entire covering organ capsule stem cells are contained  . When both areas are regarded as one claim, as well parenchyma as stroma are developing by this source of cells. Consequently, the nephrogenic zone and the capsule form per definition an extended niche area that covers the entire organ. In contrast, formation of human renal parenchyma is driven by branching morphogenesis that produces during the late fetal period in elongating CD tubules bifid branches  . 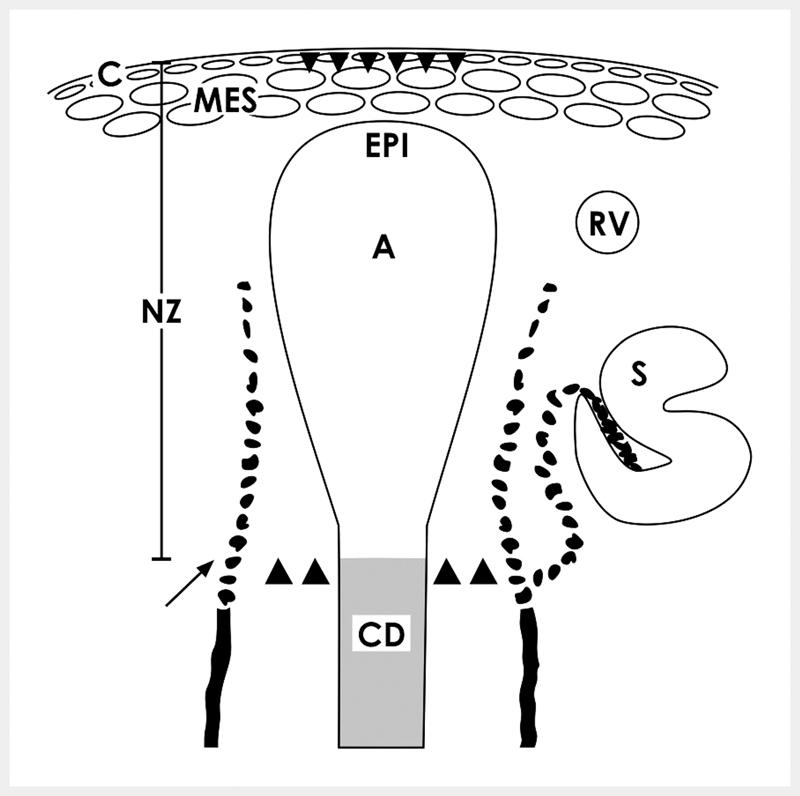 These occur in close vicinity to the organ capsule, where they dilate to form CD ampullae ([Fig. 2]). As mentioned, their tips are always orientated towards two layers of nephrogenic mesenchymal stem cells and the covering capsule. During the process of nephron induction the tip of each CD ampulla including epithelial stem cells moves towards the inner layer of mesenchymal cells. Hence, only the tip of a single CD ampulla with contained epithelial cells and some of the nearest GDNF+/Six2+/CITED1+ mesenchymal cells are regarded as an individual renal niche  . For the human fetal kidney no data are available, but for the neonatal rabbit kidney it was shown that each of these niches is mounted via microfibers with the organ capsule ([Fig. 3]) . Label by anti-collagen type I, II, III and Soybean agglutinin (SBA) depicts that microfibers originate on the basal lamina covering the tip of a CD ampulla. Those line through both layers of mesenchymal stem cells to fasten on the inner side of the capsule. Presence of these microfibers illustrates that epithelial and mesenchymal stem cells do not meet by accident during induction of a nephron but are integral part of a special mounting. 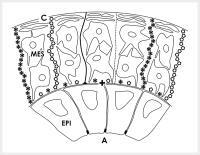 It further ensures that all of the niches stand in a certain lateral and vertical order along the inner side of the organ capsule. Fig. 3 Schema shows microfibers linking a stem cell niche with the inner side of the capsule. The basal lamina of a CD ampulla (A) tip is labeled by a cross (+). At this site microfibers binding Soybean Agglutinin (SBA; black line) and anti-collagen type I (black asterisks), type II (light circles), and type III (dotted line) originate, cross the interface, line through the 2 layers of mesenchymal stem cells to be linked on the organ capsule (C). (EPI) epithelial, (MES) mesenchymal stem cells. Actual morphological data show that epithelial and mesenchymal stem cell bodies are not in direct contact but stand at a distance between 1 to 2 µm ([Fig. 4])  . 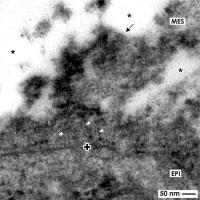 The resulting interface between was already earlier observed by optical microscopy     and transmission electron microscopy    . It was illustrated in mice, rat, rabbit and human developing kidney, however, no further attention was directed to this spatial structure. On neonatal rabbit kidney it was further shown that the basal aspect of epithelial stem cells is covered by a consistent basal lamina including a lamina fibroreticularis that exhibits a conspicuous fiber meshwork ([Fig. 5a]) . Special fixation of specimens in GA solution including cupromeronic blue (CMB) reveals that numerous braces of proteoglycans are contained in the basal lamina and the interface separating mesenchymal and epithelial stem cell bodies ([Fig. 5b]). Proteoglycans also occur on the surface of mesenchymal cell projections crossing the interface . Moreover, specimens fixed in GA solution including ruthenium red (RR; [Fig. 5c]) or tannic acid (TA; [Fig. 5d]) unmasks previously not supposed textured extracellular matrix within the interface . Fig. 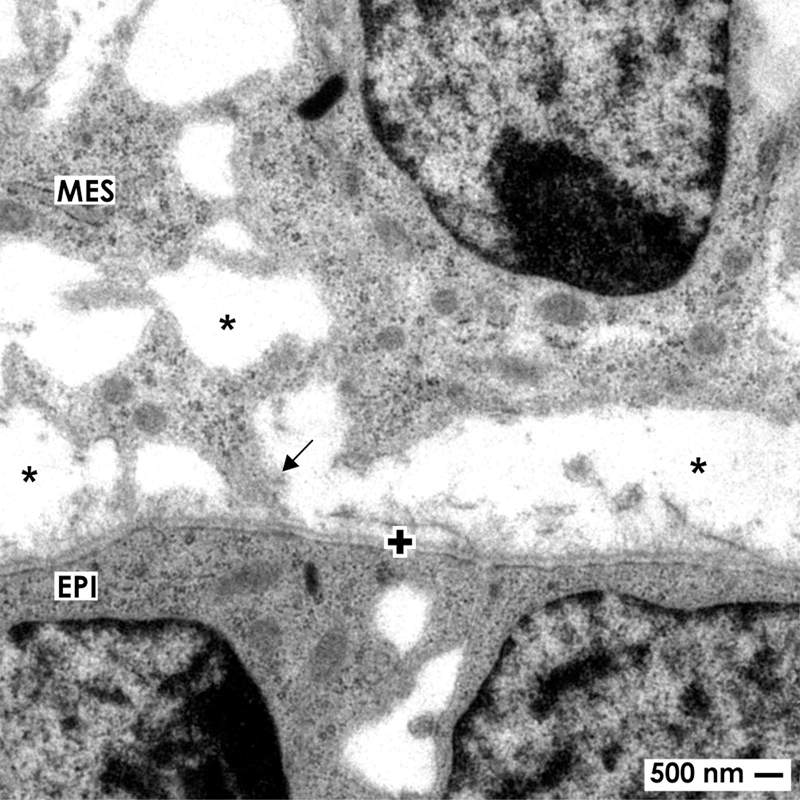 5 Transmission electron microscopy of the stem cell niche in neonatal rabbit kidney illustrates projections (arrow) of mesenchymal (MES) cells, which cross the interface (asterisk) to contact epithelial (EPI) cells. a Specimens fixed by conventional glutaraldehyde (GA) solution suggest that the interface is void. b Fixation by glutaraldehyde solution including cupromeronic blue (CMB) shows that numerous braces of proteoglycans are recognized on the surface of cell projections and within the basal lamina of epithelial stem cells. c Specimens fixed by GA solution including ruthenium red (RR) or d tannic acid (TA) unveil masked textured extracellular matrix at the interface. The basal lamina at the tip of a CD ampulla is labeled by a cross (+). When impairment of nephrogenesis in the kidney of preterm or growth restricted babies is under analysis, both remodeling of illustrated microfibers and textured extracellular matrix at the interface of the niches has to be considered ([Fig. 4] and ). For example, tissue transglutaminases (TGases), matrix metalloproteinases (MMPs) and membrane targeted MMPs (MT-MMPs) are key mediators of this important process  . An equilibrated activity of TGase controls growth factor-stimulated signaling and in turn cell proliferation  . It remains to work out, whether imbalance of TGase activity on illustrated microfibers or on extracellular matrix at the interface influences cell biological activity within renal stem cell niches of preterm infants. In the case an increased activity occurs, inhibitors of TGases may help to find back to an equilibrium between synthesis and degradation . 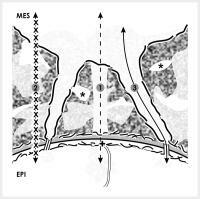 Actual morphological data exhibits that masked extracellular matrix of the interface acts as a spacer to separate the bodies of mesenchymal and epithelial stem cells within a renal niche ([Fig. 4] and ). Further projections (also called cytonemes or signaling filopodia) of mesenchymal cells cross the interface to contact the basal lamina of epithelial stem cells at the tip of a CD ampulla. Immunohistochemistry earlier showed that in a mesenchymal cell projection integrin α8β1 is present, which binds to nephronectin in the basal lamina of epithelial cells   . At this site also the micro-tubule-dependent motor protein kinesin KIF26B was detected that is involved in regulating attraction, signal transduction and developmental patterning  . Transmission electron microcopy further reveals that a projection penetrates the basal lamina at the tip of a CD ampulla  . 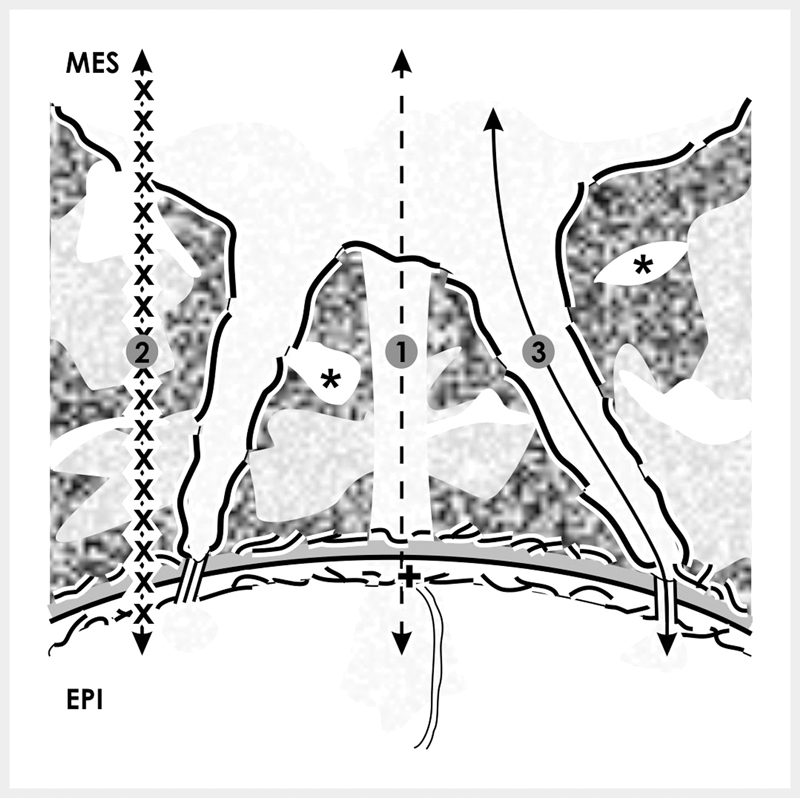 At the end of a projection extracellular matrix forms a sleeve to ensure the contact. Further tunneling nanotubes occur between the end of a projection, the basal lamina and the basal plasma membrane of an epithelial cell ([Fig. 6]). This important finding reveals that a path for cell to cell communication and transport of molecules via tunneling nanotubes exists . It is obvious that disturbance of transport in tunneling nanotubes between mesenchymal and epithelial stem cells will have an impeding influence on this communication during induction of a nephron. Fig. 6 Transmission electron microscopy of the stem cell niche in neonatal rabbit kidney shows cell to cell contacts via tunneling nanotubes. A projection (arrow) of a mesenchymal (MES) cell is crossing the interface (asterisk) to perform a communication with epithelial (EPI) cells via tunneling nanotubes (arrow heads). 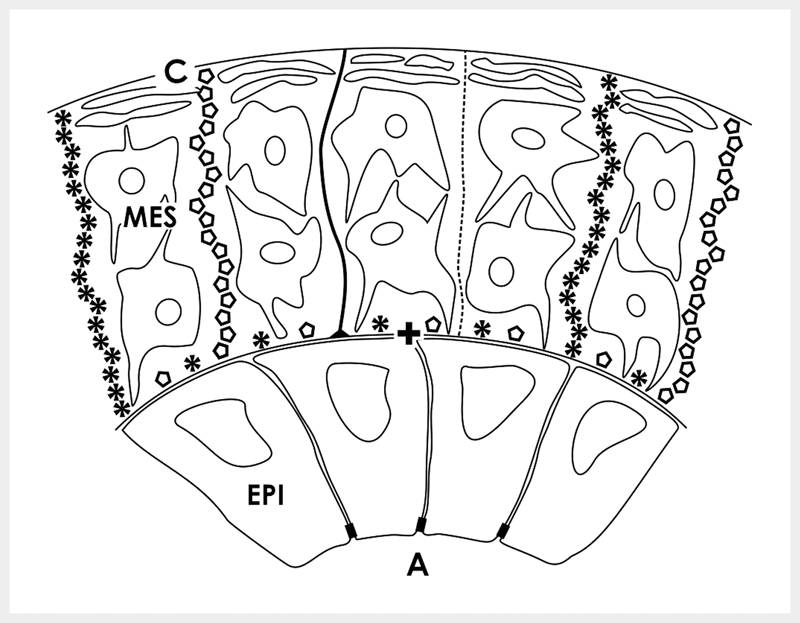 The basal lamina of epithelial cells within the tip of a CD ampulla is marked by a cross (+). Morphogens control the nephrogenic zone and contained stem cell niches. In an intact human kidney morphogens are active from organ anlage up to the birth . Short before, morphogenic processes are downregulated and the last generation of niches aligned beyond the capsule is vanishing by an unknown molecular mechanism. However, so long as nephrogenesis is active, morphogens influence in a hierarchical manner a series of quite different developmental processes . For example, morphogen Mdm2 fulfills in this orchestra a more general function such as supervision of survival, proliferation and competence of renal stem cells. Its positive signaling provokes expression of typical markers such as Amphiphysin, Cited1, Sall1 and Pax 2 . More specialized tasks fulfill morphogens, which enable induction of a nephron  . It starts, when a branch of an elongating CD tubule forms a CD ampulla . Only for a certain frame of time the nearest layer of GDNF+Six2+CITED+ mesenchymal stem cells is exposed to the basal side of epithelial stem cells contained in the tip of a CD ampulla. Yet a reciprocal signaling of morphogens such Glial cell line-Derived Neurotrophic Factor (GDNF), Bone Morphogenetic Proteins (BMP4, BMP7), WNT family members (Wnt4, Wnt5a, Wnt9b) and Fibroblast Growth Factor (FGF8) takes place      . For an effective transmission of these signals receptors such as Fgfr1, Fgfr2, Gfra1, Notch 2, Ret tyrosine kinase receptor and transcription factors such as BRN1, FoxC2, LIMI, Osr1, Sall1, Pax2 and Wt1 must be activated . When the signaling of these morphogens was successful, induced GDNF+Six2+CITED+ cells separate, migrate and aggregate on the lateral side of a related CD ampulla. Here they perform a mesenchyme-to-epithelial transition (MET) to develop into a renal vesicle and then a S-shaped body as first visible signs of a developing nephron . During the last years, transgenic animals and related experimental tools gave basic insights in morphogen signaling during nephrogenesis . For example, by knocking down a gen for morphogen synthesis its missing action leads to restricted development. However, looking to the last link in the chain of molecular actions, there is nothing said about primary links such as regulation of morphogen synthesis, processing, secretion, binding on extracellular matrix and transport from one cell to the other. Due to missing information over time, the general impression appeared that all of the mentioned morphogens in the renal niche have more or less the same biophysical properties and that all of them reach their target by diffusion. As we know yet, this assumption is definitively wrong. Considering a therapeutic prolongation of nephrogenesis in preterm or low birth weight babies, it is now time to reinvestigate regulation and transport of morphogens in the nephrogenic zone and contained stem cell niches for finding a suitable strategy for drug delivery. To obtain concrete information about transmission of the morphogen signal, site-specific features of the renal stem cell niche were simulated in transfilter culture experiments. For example, morphogen Wnt4 expressing NIH3T3 cells were mounted for tubule induction on one side, while isolated nephrogenic mesenchyme was placed on the other side of a filter. Experiments demonstrated that separating filters with pore sizes of 0.1 µm and above support induction of tubule formation, while pores of 0.05 µm abolish it. By the way, morphogens are so small that a pore of this size is not an obstacle during transport. Surprisingly, solubilized molecules in form of a supernatant from Wnt4 expressing cells were not able to induce formation of tubules . This unexpected result points out that the transport of a morphogen during induction of a nephron is not as easy as it looks, cannot be explained alone by diffusion and seems to act via contacting cell projections . Also earlier morphological findings in niches of embryonic kidney  and further transfilter culture experiments  contradict the general assumption that all morphogens reach their target by diffusion. To shed some light on the complex transport matter, one has first to bear in mind that each sort of involved morphogens has individual biophysical properties. 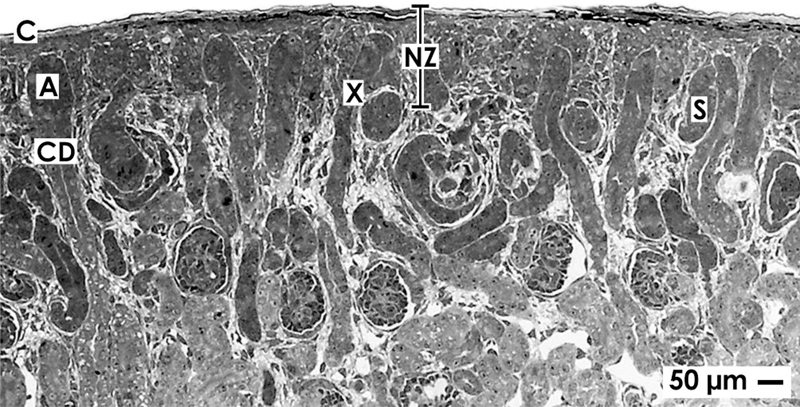 Second, action of different sorts of morphogens must be merged with the peculiar microarchitecture of the nephrogenic zone and contained niches ([Fig. 7]). Third, label by cupromeronic blue depicts that within the interface, on the surface of cell projections and on the basal lamina proteoglycans are contained that can principally influence transport by selective binding of morphogens . Finally, communication between mesenchymal and epithelial cells via projections respectively tunneling nanotubes points out that a route for a dosed transport of various molecules including morphogens principally exists . Fig. 7 Schematic illustration informs about 3 possible routes for the transport of morphogens within the renal stem cell niche. Mesenchymal (MES) and epithelial (EPI) cells are separated by an interface (asterisk) including textured extracellular matrix. Projections of mesenchymal cells cross it to establish a communication via tunneling nanotubes. It is supposed that morphogens with good solubility are transported by diffusion (1). Morphogens with minor solubility are secreted in interstitial fluid, bound on extracellular matrix, stored and provided on demand (2). Morphogens with poor solubility are transported in cell projections and tunneling nanotubes (3). The basal lamina of epithelial stem cells at the tip of a CD ampulla is marked by a cross (+). Detailed knowledge about molecular and biophysical properties of involved morphogens is required, when a therapeutic prolongation of nephrogenesis in the kidneys of a preterm infant is under consideration. In the past it was fairly easy to suppose that the distance between mesenchymal and epithelial stem cells during nephron induction is minimal and that involved morphogens have the same good solubility in saline solution  . Regarding these terms, the route for a diffusing morphogen is short and loss by dilution in interstitial fluid will be unattended small. In turn, a sharp gradient is building up, so that an effective concentration of a morphogen will reach the related receptor . All of that sounds convincing but was not verified for the renal stem cell niche. To obtain better insights, merging between the complex microarchitecture of the nephrogenic zone and the different biophysical features of involved morphogens helps. When morphogens are sorted in good   , minor    and poor    solubility in saline solution, their transport can be allocated to recently detected morphological details ([Fig. 7]). Since concrete data for the human renal stem cell niche is not available, the here introduced concept is founded on neonatal rabbit kidney   and cell biological data raised in other developmental systems . 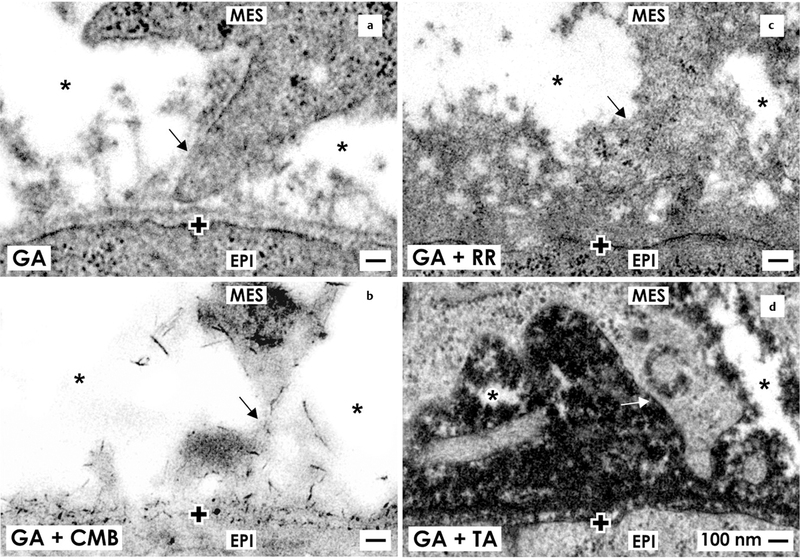 Special fixation of specimens with glutaraldehyde (GA) solution including cupromeronic blue, ruthenium red respectively tannic acid for transmission electron microscopy demonstrates that extended areas of the interface within the renal stem cell niche contain filigree extracellular matrix  . In contrast, a complementary but much minor space does not show any label, appears to be filled only by interstitial fluid and is consequently best suited for diffusion of a readily soluble morphogen (Fig. 7.1). Due to its biophysical features, GDNF is an ideal candidate for transport this way. The molecule contains 134 amino acids, is secreted as a glycoprotein and is therefore readily soluble in interstitial fluid . It may surprise, but only GDNF synthesized by mesenchymal stem cells was up to date defined in literature as a long-distance diffusible morphogen that binds on Ret tyrosine kinase receptor and a co-receptor GFRα1 localized at the tip of a CD ampulla  . Cupromeronic blue label on mesenchymal cell projections and on the basal lamina of epithelial stem cells illustrates syndecans and/or glypicans ([Fig. 5b]), while label by ruthenium red ([Fig. 5c]) or tannic acid ([Fig. 5d]) points to perlecans and other proteins of extracellular matrix within the interface of the niche . Earlier published literature shows that proteoglycans are special modulators of kidney development interacting with GDNF, molecules of the FGF and TGFβ superfamilies, EGF receptor ligands and HGF    . The general concept is that binding of related morphogens on proteoglycans acts as a ‘morphogenic switch’ that influences as an inhibitor or facilitator the fine-tuning of a morphogen gradient between interacting cells (Fig. 7.2). The special meaning of extracellular matrix is recognized by the fact that environment lacking heparan sulfate proteoglycans (HSPGs) does not support formation of an effective Wnt gradient abolishing in turn further development . Morphogens Wnt4, Wnt5a and Wnt9b have an influence on renewal and differentiation of nephron progenitors, CD ampulla branching and nephron induction  . However, quite rarely information is given that Wnt molecules have posttranslational modifications in form of a saturated palmitic acid and an unsaturated palmitoleic acid so that they resemble lipoproteins with a poor solubility in interstitial fluid . For that reason it appears most probable that they are not sprayed within the interstitial interface for diffusion but are secreted by epithelial cells only in the vicinity of mesenchymal cell projections (Fig. 7.3). In such a case they reach the plasma membrane of the target cell, where they can bind to a cargo that is able to transport Wnt molecules  . For example, in Drosophila Tkv-GFP receptor puncta are present in cell projections that move here in an anterograde or retrograde direction . Morphogen Sonic Hedgehog (Shh) controls renal patterning . This sort of molecule is not sprayed into the interstitial space but is produced in form of a particle that remains associated during transport with the cell surface on cell projections  . Also the group of Bone Morphogenic Proteins (BMPs) belongs to morphogens with poor solubility in interstitial fluid . Due to biophysical characteristics the transport of a BMP molecule through the interface by diffusion is unlikely. Instead, transport of BMPS at the contact site between a mesenchymal cell projection and an epithelial cell seems to be more probable. At those sites a BMP molecule can bind at the plasma membrane  and will be transported then with its receptor via microtubules . Actual literature demonstrates that projections of mesenchymal stem cells cross the interface and the adjacent basal lamina to establish a contact with epithelia stem cells at the tip of a CD ampulla ([Fig. 4])  . Astonishingly, between the end of a projection and the basal plasma membrane of an epithelial cell tunneling nanotubes occur to establish a cell to cell communication ([Fig. 6]). This path is also suitable for transport of organelles, membrane compounds and other kinds of molecules      . Although yet not proven, it appears most likely that also morphogens maintaining stemness and triggering nephron induction are transported this way at the right time, correct site and in a dosed amount (Fig. 7.3). However, up to date those transport functions in combination with tunneling nanotubes are not known for the renal stem cell niche. Instead they were investigated by in vitro experiments with renal cells in different context  . In sum, due to mentioned arguments and many unanswered questions the transport of morphogens within the renal niche via tunneling nanotubes waits to be investigated, when prolongation of nephrogenesis in preterm or low birth weight babies is therapeutically intended   . Beside mentioned routes, the intercellular transport of morphogens may also principally take place by vesicles such as exosomes (40–100 nm) or microvesicles (100–1 000 nm)  . In those vehicles as well mRNA, microRNA as morphogens can be shuttled.  . However, up to date literature does not inform about transport of morphogens by vesicles within the renal stem cell niche. Due to running nephrogenesis one would assume that the nephogenic zone is provided from the medullary side by a perfect capillary system. However, the contrary is true. Vascular supply on this site is incomplete, and it was up to date not thoroughly examined. Histochemistry using Ulex europaeus I lectin on human fetal kidneys demonstrated that in the area of starting nephrons not intact capillaries but only endothelial cell strands exist . In the neonatal rabbit kidney immunohistochemistry exhibited that capillaries line from cortical radiate arteries towards the nephrogenic zone. Vessels under construction occur on developing glomeruli. Further strands of endothelial cells line to the lower cleft of S-shaped bodies, where the glomerular tuft is arising ([Fig. 8]). 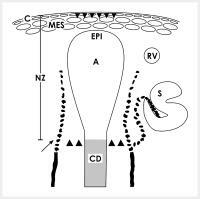 Only some endothelial cells occur at the lateral aspect of CD ampullae . However, at the niche site including the tip of a CD ampulla and neighboring mesenchymal stem/progenitor cells, endothelial cells are not present. For the rat kidney it was shown that expression of endothelial nitric oxide synthase takes place on developing S-shaped bodies but not within the mesenchymal cell layers . An actual investigation on developing mice kidney exhibits that forming vessels at the nephrogenic zone are not flowed, although oxygenation is able to drive nephron progenitor differentiation . Interestingly, an alternative spring for nutrition and oxygen might be that capillaries within the capsule produce interstitial fluid that is transported in the before mentioned but not carefully investigated tunnel system within the tunica muscularis of the organ capsule . Hence, when a drug or a morphogen for prolongation of nephrogenesis is administered by infusion via the renal arterial vessel system, it will reach only the inner limit of the nephrogenic zone corresponding with developing glomeruli, late S-shaped bodies and sites of CD tubule differentiation  . On the lateral aspect of CD ampullae capillaries are under construction, but on niches represented by the tip of a CD ampulla and neighboring GDNF+Six2+CITED+ mesenchymal stem cells a perfused capillary system is not established. In turn, medication can reach this area only by long distance diffusion via interstitial fluid. It is not clear, whether delivery is causing in preterm infants alterations of the vascular supply especially on the developing capillaries within the nephrogenic zone. To support provision with nutrition and oxygen in that situation, an actual therapeutic concept is to stimulate formation of capillaries by thymosine ß-4  . The molecule is a peptide consisting of 43 amino acids and is expressed in the developing kidney. Moreover, thymosine ß-4 forms a complex with integrin-linked kinase resulting in an activation of survival kinase Akt that finally stimulates production of vascular endothelial growth factor (VEGF). Without interpreting possible side effects, the chances for a therapeutic application are not bad, since synthetic thymosine β-4 shows a perfect biodistribution . To impede adverse effects on other organs, one possibility is to administer thymosine β-4 via renal arteries. However, its pharmacological effect on the nephrogenic zone and its ability to stimulate formation of new nephrons was up to date not under solid investigation. One must also consider that a therapeutically increased level of VEGF might be antagonized so that the expression of pigment-epithelium-derived factor (PEDF) in the nephrogenic zone would shift in the focus of actual therapeutic interest . VEGF is a special morphogen during kidney development . Beside its impressive angiogenic role, VEGF also stimulates branching of the ureteric bud via VEGF-receptor2 . In culture experiments with rat ureteric buds isolated from organ anlage it was shown that the response is dependent on the dose of administered VEGF. These data place VEGF in an unique position of being principally able to modulate as well vascular development (stroma) as branching of ureteric buds (parenchyma) and in turn induction of nephrons. However, between organ anlage in animal species and development of fetal parenchyma in a human kidney are differences. For example, switches in the developmental program result in a special pattern of CD ampullae in the nephrogenic zone of a fetal human kidney . Consequently, it is urgent to examine, whether expression of VEGF-receptor2 in the CD ampulla of a late fetal kidney is still the same as it was in the ureteric bud during organ anlage. Moreover, the microenvironment in the nephrogenic zone must be physiological, since hypoxia inhibits nephrogenesis through paracrine VEGF despite its ability to enhance tubulogenesis . Recent data show that VEGF is expressed in the embryonic kidney even in the absence of any external hypoxic stimulus . Moreover, during development of fetal renal parenchyma abundant renin producing cells occur along maturing nephrons and the nephrogenic zone. During proceeding nephrogenesis renin expression shifts in a wavelike pattern from the vessel wall of cortical radiate arteries to terminal portions of developing afferent arterioles on arising glomeruli. Those develop at the lower part of S-shaped bodies . Most interestingly, lack of prorenin receptor (PRR) in the ureteric buds in mice causes reduced branching during development resulting in a decreased nephron endowment . Additionally, intact signaling between renin, prorenin and PRR maintains the nephrogenic stem cell population supporting in turn progression of nephrogenesis . For a human fetal kidney short before birth, it would be therefore important to known, whether renin, prorenin and PRR have a vital influence on stem cell niche activity. In that context one must also analyze, whether renin expression during fetal development of the kidney depends on intact sympathetic innervation and on ß-adrenergic receptor input . Finally, one should bear in mind that in transfilter cultures only embryonic spinal cord and brain were effective, whereas the isolated ureteric bud did not induce tubules in nephrogenic mesenchyme . Before described morphogens belong to highly effective natural molecules that maintain in the nephrogenic zone stemness and promote nephron induction within the niche. However, due to individual biophysical features, uncertain bioavailability and unclear form of administration, it is questionable, whether they can be administered in preterm infants for therapeutic prolongation of nephrogenesis. In this context, also possible side effects of administered morphogens must be investigated. For example, exogenously applied GDNF promotes unwished formation of ectopic ureteric buds . To avoid therapeutic administration of morphogens, a series of other molecules is on the screen, which appears as a viable alternative for prolongation of nephrogenesis. For years lithium (Li+) is known as a potent mood stabilizer. Actual experiments show in this connection that the ion accumulates in neurogenic brain regions . However, in earlier culture experiments it was demonstrated that Li+ ions can also elicit the early stages of epithelial differentiation in isolated nephrogenic mesenchyme . Further Li+ ions reduce glycogen synthase kinase-3 activity directly on the molecule and by increasing the inhibitory phosphorylation of the enzyme . In this context, it was shown that not only Li+ ions but also 6-bromoindirubin-3’-oxime act as inhibitors on glycogen synthase kinase-3 stimulating in turn in mesenchyme abundant epithelial differentiation and full segregation of nephrons . Moreover, glycogen synthase kinase-3 inhibition by CHIR99021 promotes self-renewal of embryonic stem cells in mice . Without wanting to interpret ethical issues, for human pluripotent stem cells (PSC) it was shown that incubation with the Wnt pathway activator CHIR99021 in combination either with retinoid AM580 or TTNPB results in renal tubule-like structures . When PSCs were treated by CHIR99021 in combination with fibroblast growth factor 9 and activin, cells could be generated that express markers of intact nephrogenic mesenchyme . Finally, in culture experiments isolated competent nephrogenic mesenchyme can be induced to develop renal tubules. In most of those cases culture medium was used that contained animal serum. Interestingly, application of serum-free respectively chemically defined medium impedes formation of renal tubules. In contrast, supplementation of chemically defined medium (I-MEM) including transferrin leads to effective formation of tubules . Consequently, in the case a too low iron content in the nephrogenic zone of a preterm respectively low birth weight babies is causing impairment of nephrogenesis, administration of transferrin might compensate it . Possibly, a culture model with pieces of isolated but intact nephrogenic zone can help to solve some of the assignments in the initial phase of experimental clearance . Unknown is the exact microarchitecture of the nephrogenic zone. Not available is an actual analysis of the forming vessel system. Unclear is the ultrastructural composition of the renal stem cell niche. Unexplored are physiological parameters of cells in the nephrogenic zone. Unidentified is the intrinsic cell communication via tunneling nanotubes. Not explored is the transport of morphogens from cell to cell. Unacquainted is the therapeutic administration of drugs. Unknown are side effects of eligible drugs. To dampen exaggerated expectations, only a solid base of research built up within the next years will exhibit the path for a secure therapy to prolong nephrogenesis in preterm or low birth weight infants. It is obvious that the pre-clinical environment must closely cooperate with clinicians of neonatal intensive care units, involved pharmacologists and pharmacists. A lot done, a lot more to do - so let us get started! Project was supported by Emeriti Research Fund (ERF), University of Regensburg, D-93053 Regensburg, Germany. 5 Luyckx VA, Perico N, Somaschini M. et al. A developmental approach to the prevention of hypertension and kidney disease: A report from the low birth weight and nephron number working group. Lancet 2017; pii: S0140-6736(17)30576-7 DOI: 10.1016/S0140-6736(17)30576-7.